In a Dog’s World, by Mary E. Lowd – Book Review By Fred Patten. In a Dog’s World, by Mary E. Lowd. Dallas, TX, FurPlanet Productions, July 2015, trade paperback $9.95 (181 pages), Kindle $6.99. This novella is the third book in Lowd’s “Otters in Space” series following Otters in Space (2010) and Otters in Space II: Jupiter, Deadly (2013), although her short fiction “When a Cat Loves a Dog” in Five Fortunes (edited by Fred Patten) and “A Real Stand-Up Guy” (with Daniel Lowd) in Allasso volume 3 (edited by Brian Lee Cook) are also in the same “world”. Humans have become extinct, and uplifted cats, dogs, otters, and a few others have inherited Earth and its space outposts. The cats and dogs are theoretically equals, but in fact the dogs are socially and politically superior, with strong prejudice in both species against the other. Lowd’s protagonists – Kipper Brighton in the two novels, and Lashonda Brooke in the short fiction – are mature cats who are disinterested in the prejudice (in Kipper’s case) or actively oppose it (in Lashonda’s case; she is married to a dog and they both want to adopt children, but are turned down by prejudiced adoption agencies among both cats and dogs). “Katasha tried not to be disappointed. Nonetheless, she spent most of her computer archaeology class worrying about whether things would really be different at Isleywood College after all. She’d been acing science classes and doodling designs for rocket ships, spacesuits, and other zero-gee gear for years, but what if her family was right, and all her work didn’t matter? No one would hear her because she was a cat; her ideas would go unnoticed; and she’d never get to work on designing a real spaceship. But Tash’s secret is that she doesn’t want to get into Isleywood just for its greater prestige or more serious education. She’s more emotionally drawn to dogs than to cats. Nevertheless, she does appreciate studiousness; she has no interest in the dog sports jocks of her high school. She sees Isleywood as the best chance to get both a good education and to meet a dog who shares her taste for learning. Katasha’s heart practically stopped when she saw the dog Bruce was gesturing at. 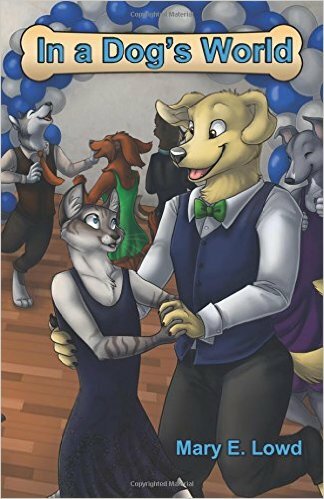 He had trim platinum blonde fur, flopped over ears, and a sturdy square muzzle, and was all dressed up in a closely fitted navy blue tunic with a mismatched green tie. Top it off with a slightly goofy but incredibly endearing grin, and that dog was gorgeous. Tash daringly asks Howell to take her to her high school’s senior prom. He agrees, and Tash counts the evening as a success, although she doesn’t know if Howell is any more than amused. (See the wraparound cover by Idess; M. Idess Sherwood. Those are Tash’s littermates on the back cover.) At least Tash’s sister Corina stops trying to set her up with a cat boyfriend. Tash prepares during the summer to move on from high school to enter Isleywood College. Her siblings – Corina, Dominic, and Dmitri – discuss their social life and plans for adulthood. Corina and Dimitri are entering the state college; Dominic is going to make his part-time student job as an auto mechanic his career. She’s pleased that her father and mother had approved of Howell as her prom date as a nice boy; she doesn’t know herself yet whether he is any more than that. This section is mostly a teenager’s social life, although there is some more background about the vanished ancient humans, and the dog-cat social inequality. The dog looked Katasha up and down. She was a short, funny looking-dog with broad, pointed ears. Of course, short for a dog meant that she was about Katasha’s height. She was very handsomely dressed. Katasha thought this dog might be a corgi. She was clearly a herding bred like Claire. Katasha could tell from the shape of her muzzle. ‘I’m Claire’s roommate,’ the dog said. Katasha tried to remember the name that Claire had mentioned on the hike. It was a kind of plant… A vine… ‘Ivy?’ she asked. In a Dog’s World is unexciting, but it’s a rich portrait of an intriguing sentient animal society. I enjoyed it, and I think that you will, too.